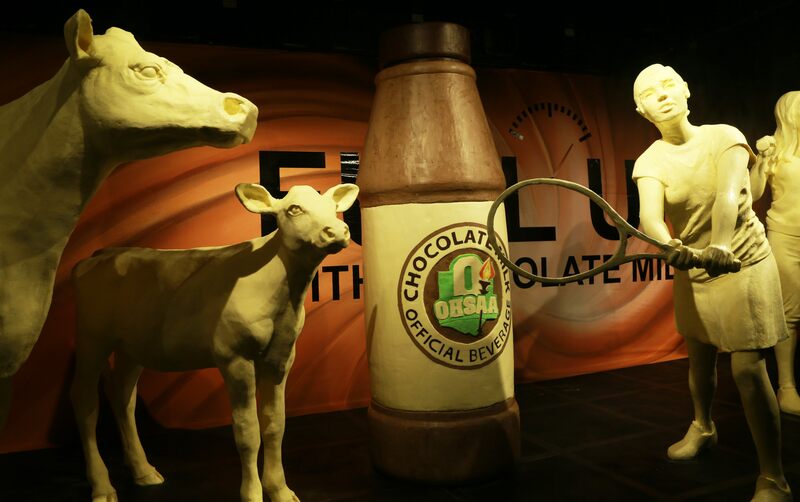 This year, the traditional butter cow and calf are accompanied by four young student-athletes and a larger-than-life bottle of the official beverage that fuels them, chocolate milk. (COLUMBUS, Ohio) – The annual butter display, one of the best kept secrets at the Ohio State Fair each year, has been unveiled. 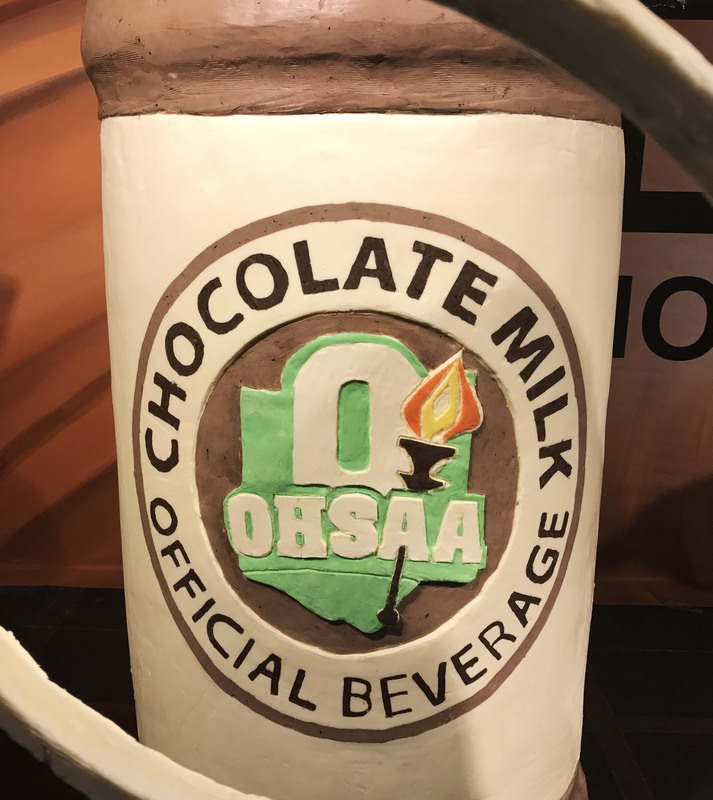 This year’s display is a salute to chocolate milk, the official beverage of Ohio High School Athletic Association (OHSAA). 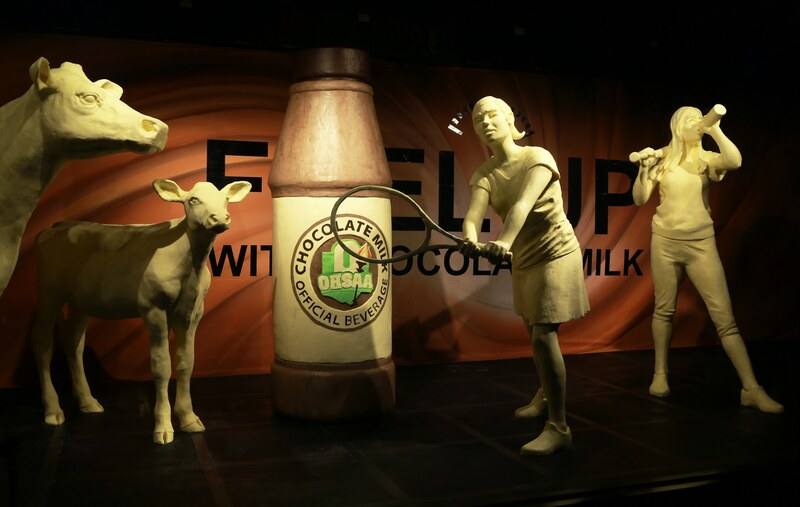 Inside the dairy cooler, the traditional butter cow and calf is joined by a larger-than-life bottle of chocolate milk, along with four high school athletes. 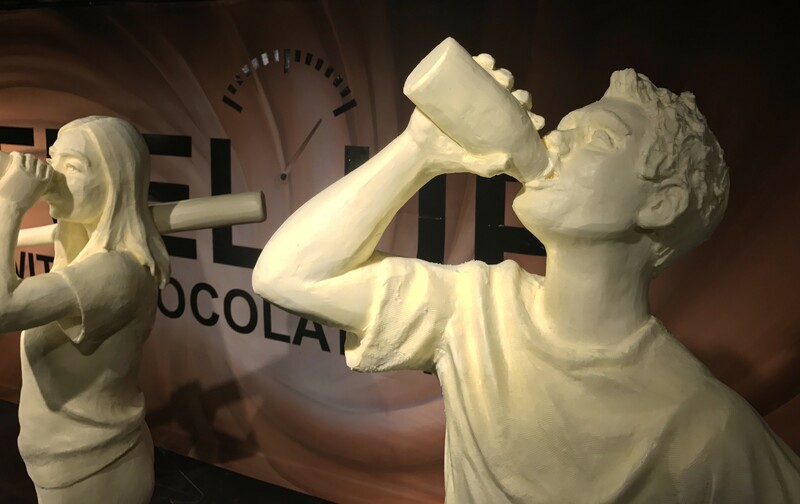 The six-foot bottle of chocolate milk featured in the butter display gets its creamy, chocolatey color from cocoa powder that’s mixed with the butter. It’s the first time the sculptors have ever added color to their masterpiece. The butter sculptures are on display in the Dairy Products Building at the Ohio State Fair from 9 a.m. until 9 p.m. each day. Fairgoers can also learn about Ohio dairy farmers and enjoy treats like ice cream, milkshakes and cheese sandwiches. 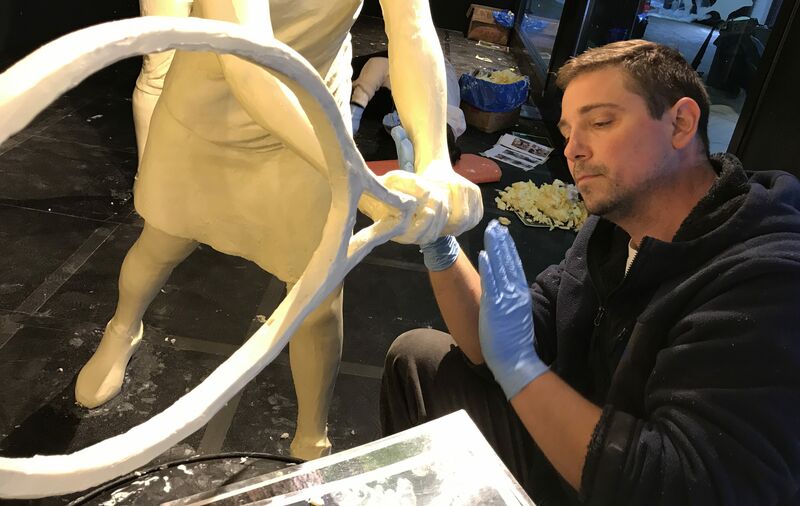 Alex Balz, one of the lead sculptors, molds the hands of the tennis player sculpture. It took sculptors about 500 hours to complete this year’s butter display, working in a 46-degree cooler. 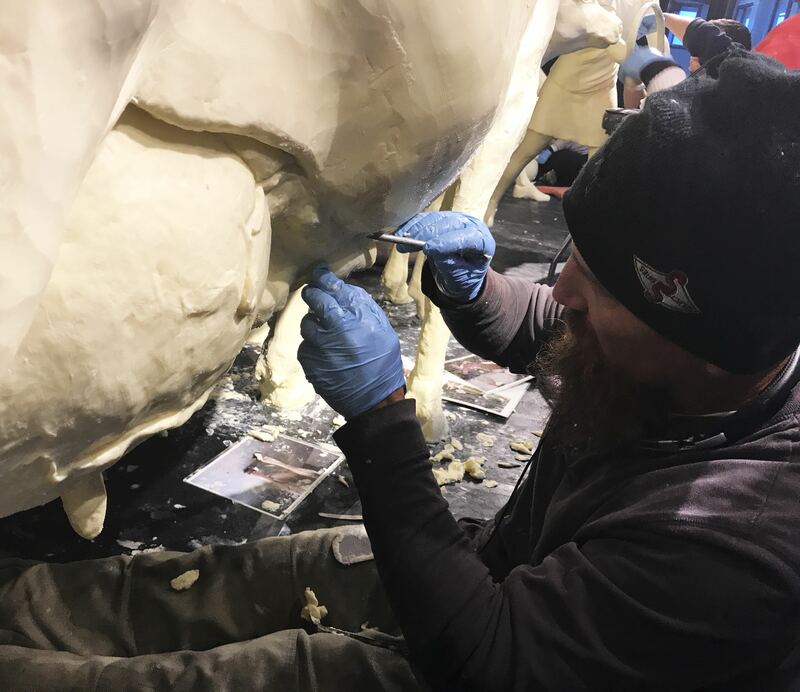 Matt Davidson works on the iconic American Dairy Association Mideast butter cow. 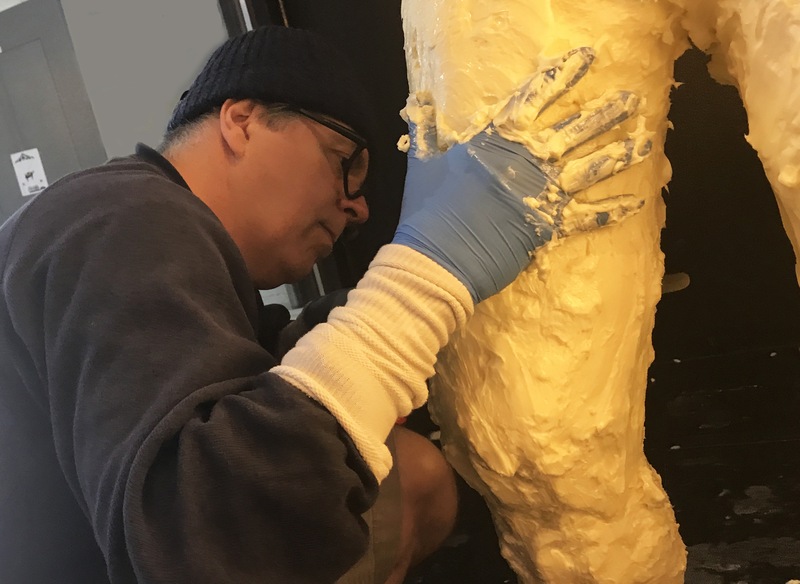 He uses his knowledge as a dairy farmer to create the life-like butter sculpture. 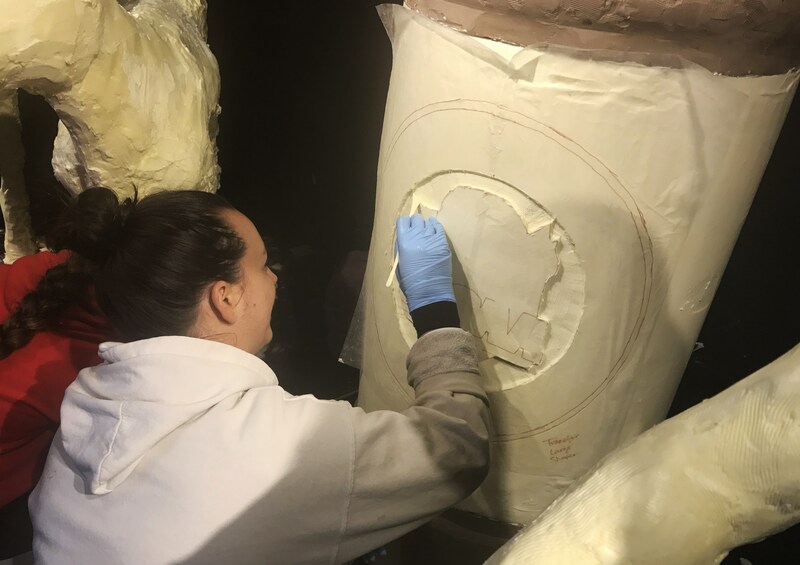 Erin Swearingen uses a small tool to etch the OHSAA logo into a larger-than-life butter sculpture of chocolate milk. After several hours of shaping and smoothing the butter, sculptors chisel in the fine details last. 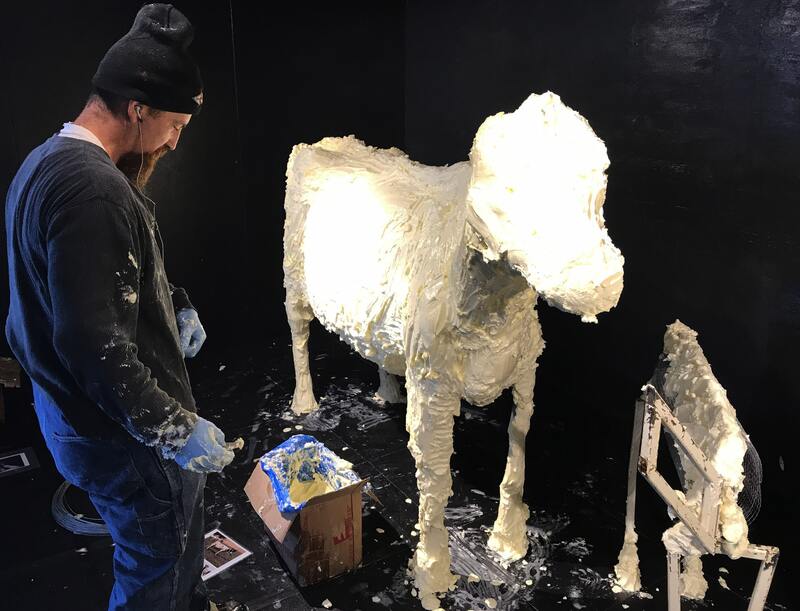 Paul Brooke is one of the lead sculptors for the American Dairy Association Mideast’s annual butter display at the Ohio State Fair. Each year, Paul and his team design and build a representation of Ohio’s history and culture - completely out of butter. 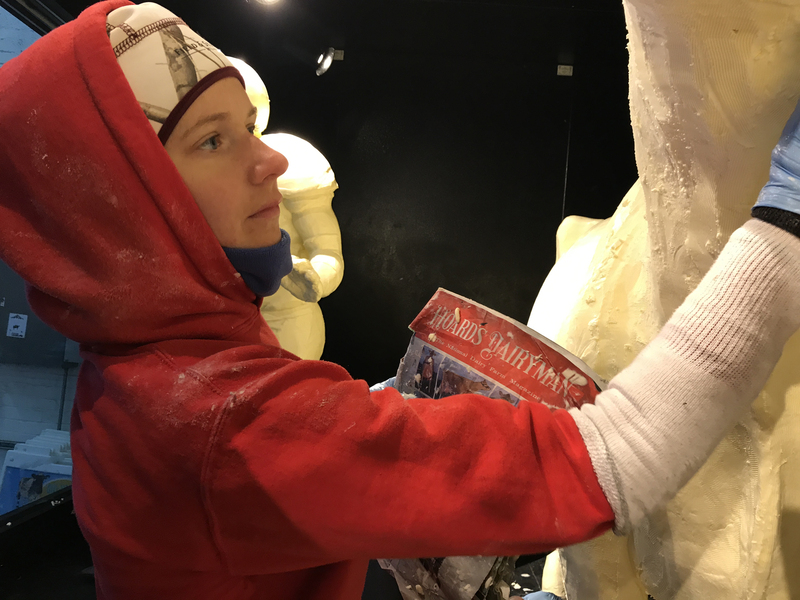 Tammy Buerk puts the finishing touches on the iconic butter cow sculpture, an attraction that has been a mainstay at the Ohio State Fair since the early 1900s. This year’s butter display is a salute to chocolate milk, the official beverage of Ohio High School Athletic Association. The American Dairy Association Mideast has partnered with the organization for nearly a decade to encourage student athletes to fuel up with healthy foods, like nutrient-rich milk. 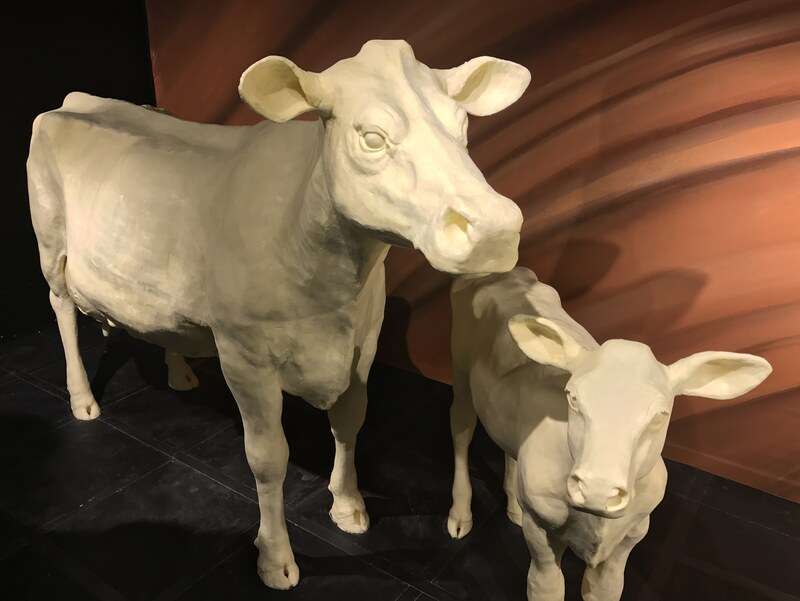 Each year, the American Dairy Association Mideast chooses a butter display theme that honors Ohio’s history and culture. This year, they celebrate the hard work and dedication of Ohio’s high school athletes and the official beverage that fuels them, chocolate milk. Fairgoers can enjoy the butter display through August 6, 2017 inside the Dairy Products Building, where they can also learn about Ohio’s dairy farms and enjoy treats like ice cream, milkshakes and cheese sandwiches. The butter display is a long-standing tradition of Ohio's nearly 2,400 dairy farmers. Each year, the display’s theme is one of the best-kept secrets leading up to the Ohio State Fair. 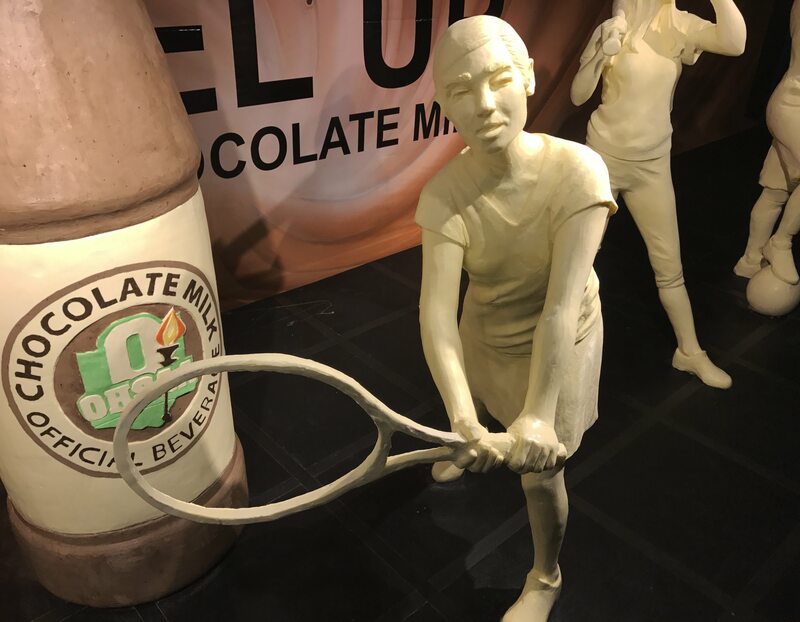 A larger-than-life bottle of chocolate milk featured in the butter display cooler at the Ohio State Fair gets its chocolatey color from cocoa powder that artists mixed with the butter. This year’s butter display celebrates the hard work and dedication that Ohio’s high school athletes show every day on the field, on the court, in the pool and on the track. Sculptors first build steel frames to support the butter, then spend hours molding and smoothing while the sculptures take shape. 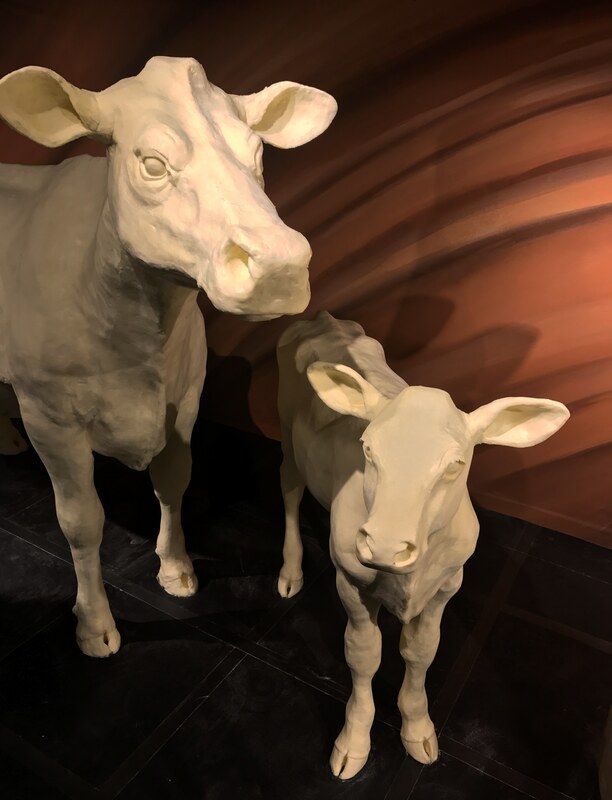 The butter cow is an Ohio State Fair tradition that dates back to the early 1900s. Today, more than half a million fairgoers enjoy the display in the Dairy Products Building each year. Please enter your email address to download. This is for verification purposes only, we will not send you spam.